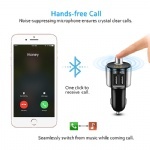 HANDS-FREE CALL: Built-in microphone with echo cancellation and noise suppression (CVC) technology, provides you with an amazing hands-free function; Automatically switch to hands-free mode from music playing status when receiving a call. 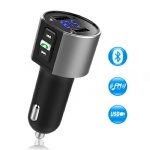 DUAL USB CAR CHARGER: Support charging two devices simultaneously via dual USB ports which output 3.4A total. 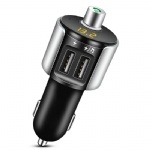 Built-in smart charging IC, will auto detect your devices and charge them at optimal speed. 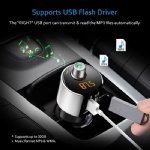 USB FLASH MP3 PLAYER: Insert a USB flash driver which contains MP3 files into the “RIGHT” USB port, then it will transmit and play the MP3 files automatically (Up to 32GB); Multi-function Button Control: Play/Pause, Previous/Next song, Volume up/down; answer/reject calls, redial call. 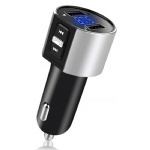 COMPACT DESIGN & WIDE COMPATIBILITY: One of the smallest car kit, so Mini, so convenient! 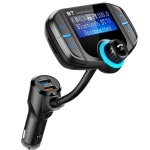 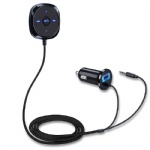 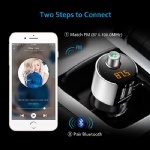 Fit for all Bluetooth enabled devices, like iPhone, iPad, iPod, Tablet, and Andriod Smartphones; Stream music, car navigation or calls from your mobile devices to car stereo system via FM radio signal( 87.5-108.0MHz).